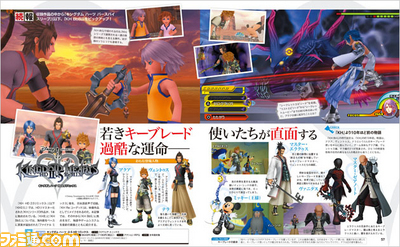 Kingdom Hearts Birth by Sleep HD will be Previewed in next Famitsu! It won't be long until you get to see more of Kingdom Hearts Birth by Sleep again, this time in HD! Famitsu announced today that their August 21st issue will feature the Kingdom Hearts prequel, and it looks to be a good one as you can see a snapshot from the Secret Episode, as well as Terra's interactions with Young Riku! It's interesting, I remember reading famitsu scans when this was first released. A bit of a weird blast from the past seeing what is essentially the same thing covered again. Not that I'm complaining. I feel nostalgic about 2008/9. I think Famitsu is trying to make me run out of tissues. The thumbnail is already gorgeous! I can't wait for the full size scans. I love that Terra and little Riku's Inheritance Ceremony is one of the largest portions of the images. I also look forward to the Secret Episode when the game is released! I can't wait to play the secret episode as Aqua in the RoD. Heartless, new boss, and we can use Master Keeper? Yes please! So HD ;~; Look at the clouds, guys! They look even more gorgeous and its just a thumbnail. Imagine getting a trophy for beating Secret Episode ;~; Guys, I'm going to cry. I LOVE BBS SO MUCH. This preview brings me back to the days before BBS was released and we were all waiting for those Famitsu articles. I thought it looked great back then just as a game, not even as specifically a PSP title. I just thought the game looked plain good. Now I know what it means for Kingdom Hearts to look good. The really made young Riku and Sora look crisp.